Aviation Updates Philippines - Leading Philippine carrier Cebu Pacific (PSE: CEB) has signed an agreement with Switzerland-based IPR Conversions Ltd to convert two of its ATR 72-500 passenger aircraft into freighter planes. This will make Cebu Pacific the only passenger airline in the Philippines with dedicated cargo planes. CARGO BUSINESS. 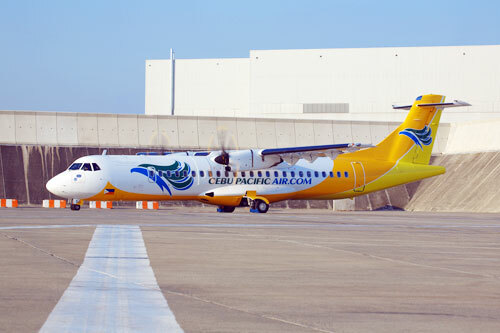 Cebu Pacific Air and Cebgo are expanding their cargo business with the introduction of its P2F ATR 72-500 with the first one arriving late-2018. Photo by Cebu Pacific Air. "We will be able to offer cargo capacity that no other carrier in the Philippines can provide," said Lance Gokongwei, President and CEO of Cebu Pacific, "With the freighter aircraft, we will further support the growing needs of the logistics industry, especially as the Philippines' e-commerce businesses expand rapidly and look for faster delivery schedules. Cebu Pacific expects to receive the first of two converted aircraft in the fourth quarter of 2018. The cargo aircraft will continue to be operated through CEB's wholly owned subsidiary, CebGo. IPR Conversions, based in Lausanne, Switzerland, is one of the leading ATR freighter conversion service providers in the world. The conversion of two of CEB's passenger ATR 72-500 aircraft into dedicated air freighters involves the installation of a large cargo door, allowing standard containers and pallets used throughout the aviation industry to be loaded. The aircraft will have space for seven (7) AKE Unit Load Device (ULD) containers; and can carry more than seven (7) tons of cargo. Both aircraft will be converted at the facility of Sabena Technics DNR S.A.S. in Dinard, France. Sabena is one of France's leading maintenance and modification services (MRO) providers for both civilian and military aircraft. Cebu Pacific has about 50% market share for domestic air cargo, currently utilizing belly space of its passenger aircraft fleet. CEB's cargo services have grown considerably, with revenues growing 29% in 2017, to PHP4.6 Billion; and 26% in the first quarter of 2018, to PHP1.3 Billion.